Upon FDA approval of Moxatag, the first and only once-daily amoxicillin treatment for pharyngitis (strep throat) and/or tonsillitis, Middlebrook Pharmaceuticals sought a quality led, experienced CMO with dedicated Penicillin packaging facilities. 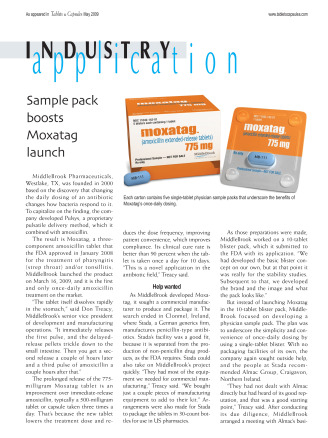 Rather than launching Moxatag in a 10 tablet blister pack as originally planned, Middlebrook focused on developing a physician sample pack to highlight the simplicity and convenience of once daily dosing by using a single tablet blister. Physician sample packs were nothing new to Almac, but the tablet size and the single tablet blister raised some technical challenges, all of which were overcome within a short timeframe by Almac’s specialist in-house engineering team. Almac’s expert engineering team designed and built high speed feeding equipment to fulfil product demand and devised and fabricated tooling to create a stable finished blister that was easy for physicians to retireve from the carton. Read this article to discover Middlebrooks approach to developing Moxatag and the steps involved in developing a successful, strategic partnership with Almac to ensure a product successful launch.